Tricia's Take: OOTD- Dots, teal and red! OOTD- School's out for the Summ-ah!! OOTD- Shopping my closet and the sale! OOTD- Dots, teal and red! OOTD- Curls can hide a bad haircut! OOTD- She wore a black polka-dot top! Shoes Anthropologie: Vantine Pumps ON SALE!! Here I am with my little first grader!!! She was so cute in her program! Very cute! I have this top and I love pairing it with fun skirts. It seems to go with almost anything! 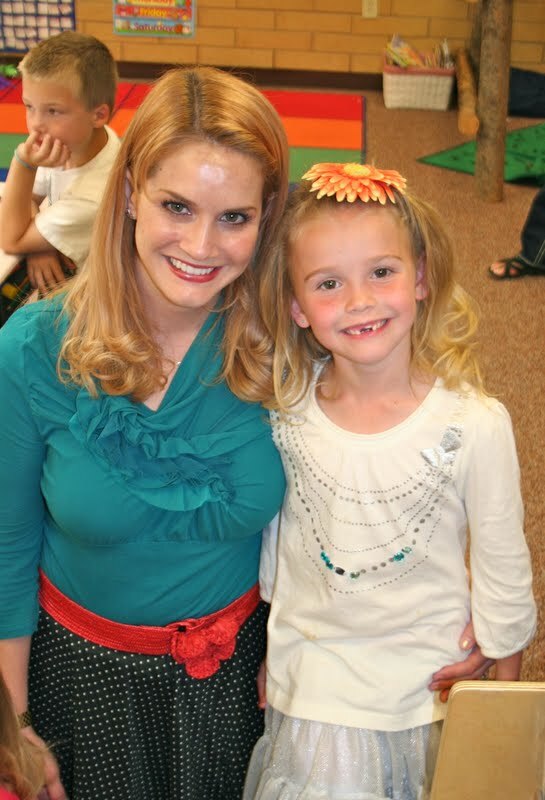 What a cute picture of you and your daughter :) I love that belt with the outfit, it just pops perfectly! anthro sale disapointed me, too :( I am no die hard anthro girl so I wondered if I was missing something! glad you agreed. I just love the black/white, red and teal! It all goes so well together. I picked up the salutations and closing (or whatever they're called!) at 2am and that was it. I went to the store at lunch and it stunk. I literally walked out empty handed! total weak sale. I almost bought those red shoes! But then I realized I should only buy one pair and I really needed a pair of closed toe grey, so there you go. I do love the polka dots on the red though. I love that teal shirt! Yeah, I stayed away from the sale -- didn't want my wallet to get a dent! Happy to hear that you weren't too excited. That will keep me away! What a cute outfit! I love the red, teal and polka dots...so freakin adorable! I picked up a few things from the sale today...I always get sucked in!!! Oh man. That skirt is so so beautiful. And I am still drooling over those shoes. Fantastic colour combination! I love the pop of red! You and your daughter look adorable! You are SO gorgeous! These colors are fantastic, that top is super cute, I love the skirt and those shoes - OH those shoes! You must have been the most adorable mom at that first grade program!